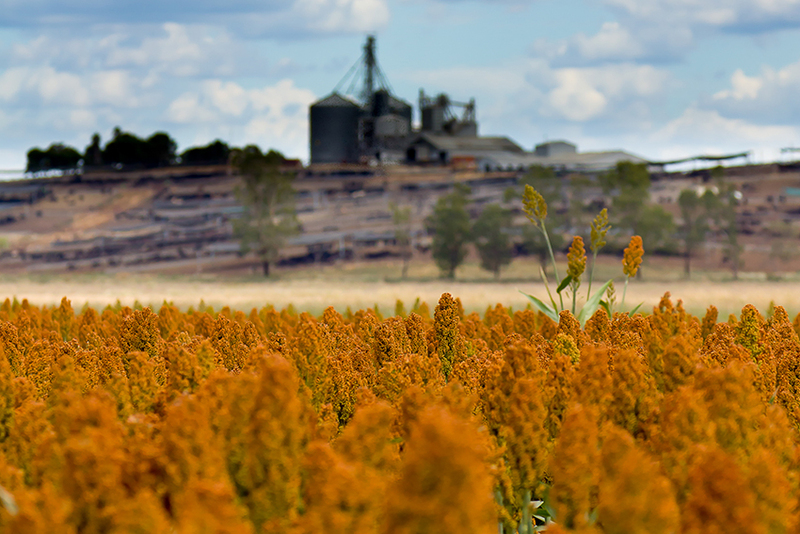 WITH cattle numbers on feed in eastern Australian feedlots again under pressure due to desperately dry conditions, sorghum is coming back into calculations as a feedgrain in Queensland and northern regions of NSW. Some Darling Downs lotfeeders told Beef Central this week that they had not fed sorghum in rations for the past six or seven years, but would now have to ‘pull out and dust-off the instruction book’ on effectively processing and feeding sorghum in a balanced ration. The developments comes as some promising sorghum crops across the downs approaches harvest stage and southern wheat and barley prices continue at high price levels. Quotes obtained this week have wheat delivered Downs February at $450/t, while sorghum is around $362-$365/t. Adding to uncertainly is a relatively wide wheat/barley spread, with barley currently at $410/t, meaning some buyers might hold-off on taking a position on sorghum, Beef Central was told. Australian Lot Feeders Association president and Darling Downs lotfeeder Bryce Camm said while conditions were patchy, there were some good sorghum crops approaching harvest in parts of southern Queensland and it was likely that some lotfeeders would include sorghum in future rations. “Pricing will be the main determinant. Once the sorghum harvest gets underway and we have a better idea of crop size, given current weather conditions, it will be interesting to see whether it has any moderating impact on domestic wheat/barley prices,” he said. While the Camm family’s Wonga Plain feedlot has not yet taken contractual positions on sorghum, Mr Camm hopes to harvest 5000-6000 tonnes off the property’s own cultivation – either to feed or to sell, depending on the economics. Continuing high feedlot occupancy due to the current conditions would also maintain pressure on feedgrain demand, he said. Mort & Co principal Charlie Mort said it was likely that his company’s 52,000 head Grassdale feedlot near Dalby would feed some sorghum in rations in coming months. “We’ll definitely be feeding some sorghum in rations at Grassdale, where grain in steamflaked, but not at the other yards, which do not use flakers,” Mr Mort said. “While there are a lot of limiting factors with feeding sorghum, through lower energy and slower rates of processing, provided it can be bought at the right price it will have a role this year,” Mr Mort said. Feedlot nutritionist Dr Matt George from Bovine Dynamics said a number of large southern Queensland feedyards were considering adopting sorghum in rations in coming months – some for the first time in years. Some yards in coming months might include one-third to one-half sorghum in their rations, blended with white grains. Dr George said use of sorghum would be primarily limited to yards that had steam-flaking capacity, rather than simply dry-rolling grain. There were some compromises involved in feeding sorghum over white grains. In some cases, the rate of production of flaked sorghum could be just 35-40pc of what can be achieved with wheat, Dr George said. That meant labour costs could also rise substantially. From the livestock side, there was also greater chance of instability in the cattle on feed, if processing was not done properly, he said. The benefit in improvement in energy availability in steamflaking sorghum was significant, however. While improvement of 2pc in energy availability over tempering was typical in barley, improvements of 18-25pc were possible in well-processed steamflaked sorghum. When processed well, the nutrient value in steamflaked sorghum could be as high as barley. “But do a half-job, and you really start bouncing cattle around, and create digestive issues,” he said. Dr George said given the preference for feeding white grains that had occurred (in part due to the narrowing spread between wheat and sorghum caused by demand for sorghum for ethanol and Chinese alcohol production), a lot of the skill-base that had been present in processing sorghum a decade ago had since been lost. “I would say the vast majority of feedmill staff working in commercial feedyards today would have very little or no experience in processing sorghum,” he said. Dr George said as a general rule, feedlot operators who were in a position to utilise sorghum given appropriate infrastructure were looking for at least an 18pc price advantage in sorghum over wheat. Sorghum prices, relative to white grains, would play a big part in just how much sorghum was included in rations in coming months, Dr George said. Class of cattle being fed could also be a consideration when feeding sorghum, he said. Heavier cattle tended to cope better with more extensively processed grain like sorghum, while lighter trade type cattle were less suitable. How much sorghum will be available this year? In his regular column for Grain Brokers Australia this week, consultant Peter McMeekin said there had been a lot of conjecture around the size of this season’s sorghum crop, after seed supplies reportedly ran out back in October. The early planted area in southern Queensland was quite significant, but plenty of seed obviously sat in the shed. The pre-Christmas rains initiated a flurry of planting activity across the holiday period. “Fortunes have been mixed throughout the growing season. Most of the early sown crops in northern NSW have struggled through without much in crop rainfall, and some have perished as a result,” he said. While there were some good areas, many early yield reports have not been flattering. At this stage, with much of the Liverpool Plains and other areas further north yet to be sown (and unlikely to be), the NSW crop would struggle to exceed 500,000t this year – well below average. Southern Queensland crops had generally fared better, Mr McMeekin said. Whilst the spring rainfall was lower than average in most districts, the crop has managed quite well. Nevertheless, there were isolated instances where paddocks failed and were sprayed out. Some of these were re-sown when later rains arrived. Overall the inner Darling Downs crops were in good condition, as were areas north of Dalby and west as far as Condamine and Miles. “At this stage, the southern Queensland crop could still be as high as 1.2 million tonnes, but regular rain is required to get that through to harvest and in the bin,” he said.